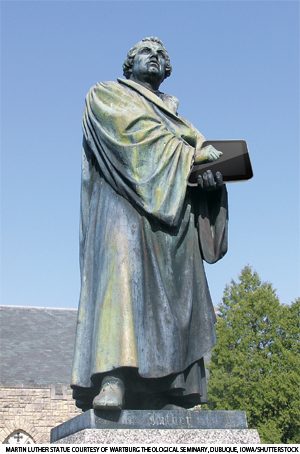 Martin Luther is frequently cited as a role model for increasing access to church for the people of his day. He translated the Bible into German and wrote the Small Catechism so families could easily study the Christian faith at home. 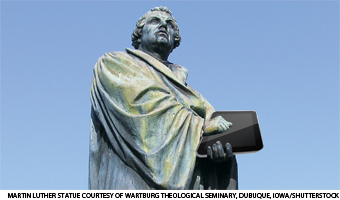 If Luther were alive today, imagine how he might use social media tools and digital technology to connect beyond our church walls, especially with those who are homebound and/or disabled. St. Stephen uses various social media channels to connect with congregants, including sermon podcasts, YouTube and Vimeo videos, Facebook, Twitter, a blog, and live streaming on UStream. In December, St. Stephen announced that one of its Christmas Eve services would be live-streamed — 60 households around the world watched. Livingood said the congregation doesn’t currently have a social media strategy that targets the homebound but acknowledges that a variety of people fall into this category. “Think about how often people are home recovering from surgery, or pregnant women who are on bed rest, or anyone suddenly stuck in bed every day for six weeks or three months. All these congregants are technically homebound and social media keeps them connected,” she said. St. Michael Lutheran, Harrisburg, Pa., started using Skype during worship services when the niece of its pastor, Larry Hawkins, got married at the church. “My oldest boy was in the military and other family members couldn’t make it, so we ‘Skyped’ them in,” he said. This started the conversation about using Skype to connect others with weekly worship services. 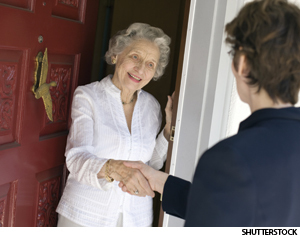 One longtime member was homebound and really missed attending church. Her family helped her set up Skype so she could be more connected to the church’s worship life again. When this member transitioned from her house to a nursing home, Hawkins asked if the facility had Internet access for residents. It did. Her family helped her set up Skype there, too, so she could continue to be connected to St. Michael’s worship life. St. Michael has approximately 50 people in worship each Sunday, but Hawkins said seven to 10 people have taken advantage of this way to participate in services. They’ve had people who were sick on a Sunday call in and ask if they could join by Skype. Although this worship option intentionally targets homebound members, St. Michael’s leaders have also used the platform for someone unable to physically attend a church meeting. It took trial and error to set up the technology. At first they tried to use Hawkins’ son’s laptop but quickly discovered the camera didn’t work well in the larger space, so they invested in a $50 webcam. Sound on the laptop was also garbled, so they patched in a device typically used to assist the hearing impaired. Instructions on how to connect via Skype are posted on the congregation’s website in the FAQs section to assist members who want to participate. Worship bulletins are also posted online. Meanwhile, on-site worshipers are encouraged to take photos and post them to social media and to tweet during worship using the hashtag #stmikehbg. As a result, those who are traveling can be part of the worship experience too. Congregations are only now beginning to get a handle on how they can use social media to connect with populations unable to physically attend worship or other events. The Evangelical Lutheran Good Samaritan Society, a nonprofit provider of senior care and services based in Sioux Falls, S.D., collaborates through its Vivo innovation program with Verizon and Logic PD to create a technology called Window to the World. The initiative began when an ELCA pastor in Rapid City, S.D., approached Vivo because he was concerned about the isolation he recognized among elderly parishioners. Upon further study, it turned out that within just this one congregation some 82 families were impacted in some way by isolation. “As seniors become less mobile, unable to travel or don’t leave their homes as often as they once did, they can become disconnected physically, socially and emotionally from the people and experience they love,” said Kelly Soyland, director of research and innovation for Good Samaritan. Early field tests connected a homebound parishioner with the quilting group she hadn’t attended for several years because she was uncomfortable leaving her husband, who had restrictive health issues, at home alone. Window to the World will use devices that already exist in a person’s home, so the box that connects to the TV will enable the functionality. At the other end, smartphones, laptops, tablets, action video cameras or video production entities will be used. Soyland said the technology has a variety of applications, such as reconnecting seniors with worship services, Bible studies and committees they once attended in person. “Being connected is so important to all of us if we are to thrive as we age,” she said. Jacqui Pagel, pastor of Trinity Lutheran, Phoenix, said the congregation set up a closed Facebook group that members use to connect more deeply beyond Sundays. They share prayer requests, joys, concerns and lots of photos. Lang is an ELCA pastor who serves ecumenically as a leadership retreat facilitator and church consultant and is the author of Our Community: Dealing with Conflict in our Congregation (Augsburg Fortress, 2002; www.augsburgfortress.org; 800-328-4648). Her Web site is www.revwriter.com. In the beginning there was email, and we saw that it was useful. Now there are hundreds of ways to communicate by text, voice, photo or video—not only via computer but with all sorts of portable electronic devices. Social media has transformed how we communicate with one another, providing both challenges and opportunities for Christians.